The fate of Forest Gate's longest surviving, purpose-built, religious building hangs in the balance since a recent attempt by an evangelical church to take it over and restore it to its original purpose has been challenged locally, by campaigners objecting to its "change of use". The building itself has an almost 200 year history - and is one of Forest Gate's oldest. It has certainly had the most varied range of uses during its existence, of any local landmark. It is, of course, the rather innocuous-looking building which until recently hosted the Angel's restaurant, at 79 Woodgrange Road. The building was then empty for some months, during which period a local catering company, Pyramid Pizza, thought they had a lease on the premises - only to be gazumped by the evangelical church. The church had its name board up for about a month and began meeting, earlier this summer, before the planning challenge was made. As the photo at the end of this article shows, it is currently without a facia board, pending an outcome of the planners' investigation. The building was constructed in 1830. Jabez Legg was a Stratford-based Congregationalist minister in the early years of the nineteenth century (see here for details of his life and the almshouses he supported, locally). 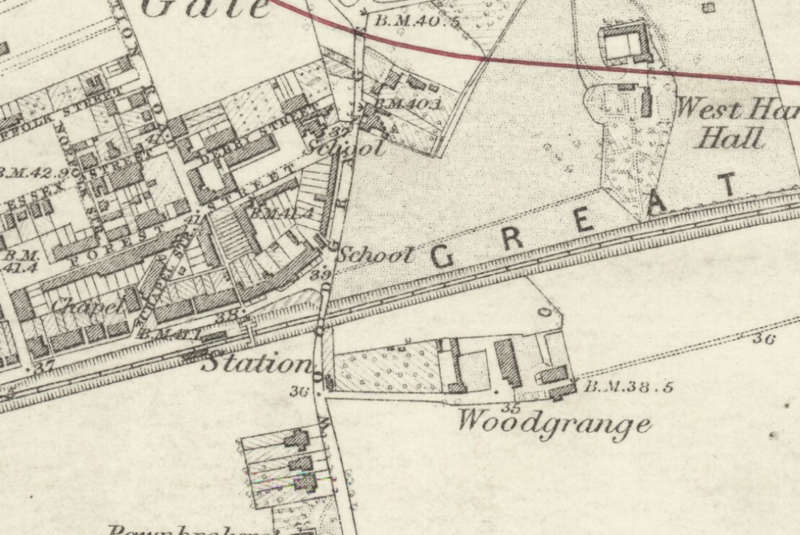 He took to preaching in a hut next to the old Eagle and Child pleasure gardens (later to become a pub), on what we now know as Woodgrange Road - previously Eagle and Child Lane - in the mid 1820's. He chose the location because the tearooms and pleasure gardens were something of a "resort" for day trippers, getting away from the hustle, bustle and filth of the streets of the inner East End - with Wanstead Flats on its doorstep. Thus, he was provided with something approaching a captive audience/congregation. Forest Gate was barely developed at this time and the tea gardens and preaching effectively operated in the middle of the countryside. 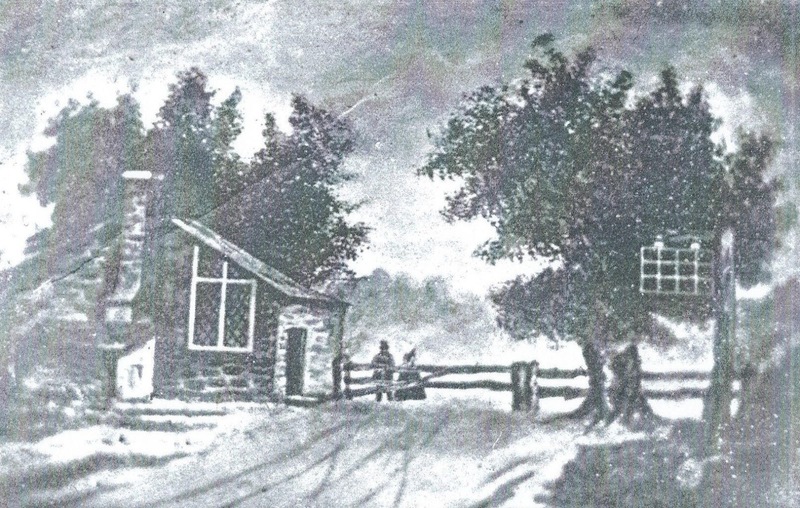 The congregation, however, soon outgrew the hut, by the old Forest Gate, so Legg and William Strange, whose daughter ran the Sunday school attached to the church, raised funds for a purpose built chapel for the congregation on the corner of Forest Lane and Woodgrange Road. spot - by the original Forest Gate. The couple were able to solicit a donation from near-by resident and prison reformer, Elizabeth Fry, to help towards the £220 construction costs of the 100 seater chapel. The building was known simply as the Forest Gate Chapel. This new, purpose-built, church expanded to run a day school during the week, in the era before state provided education. It opened in 1832 - at about the time of the passing of the Great Reform Bill, and seven years before the railway - which provided the real spur to Forest Gate's development - arrived in town. The school started with 48 pupils, when the population of Forest Gate was barely 350 people. state as a Congregationalist chapel. At this time most schools were based around religious institutions, those attached to the Church of England became generally known as "National" schools, and those associated with non-conformist churches - like the Congregationalists - were known as "British" schools. This was a "British" school, as can be seen marked on the 1863 Ordnance Survey map, see below - the first of its kind in the area. With the coming of the railways and the growth of Forest Gate, the congregation soon began to outgrow the newly established premises, and the Congregationalists were on the lookout for a new and larger home, yet again. Samuel Gurney, the banker, relative of Elizabeth Fry, and local landowner, who prospered greatly from the sale of his holdings for the development of Forest Gate, donated £100 and land to the Congregationalist church, just behind what is now Forest Gate school, in the mid 1850's, for the construction of a much larger chapel (see map, above). 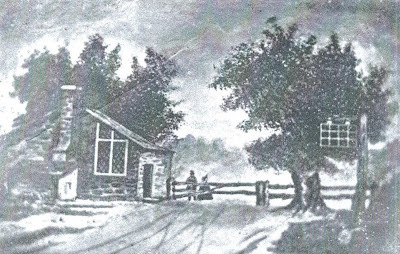 Sketch of the Chapel Street chapel. A total of £1,560 was raised to pay for the 350 seater church (see diagram below), described as being "a commodious and neat building of Italian design, similar to those recently erected in Yarmouth and Lowestoft and by the same architect". It was opened in 1856, in what the 1863 map, shown below named Chapel Street (later Chapter Street), in honour of the building. Membership of this congregation more than doubled by the 1880's - expanding significantly, in keeping with the rapid development of the area's population - and it outgrew the building. 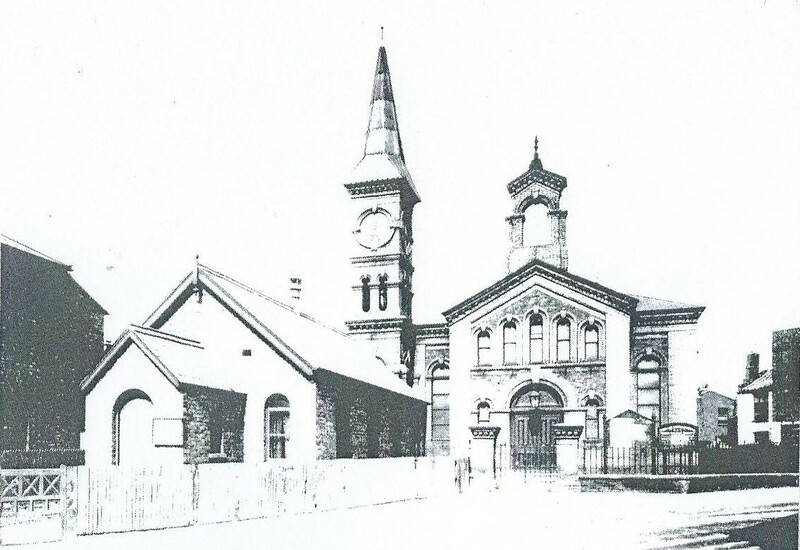 So, it was, in turn, replaced by the 1,000 seater church, which still stands on Sebert Road. We are getting ahead of ourselves. The Woodgrange Road building remained as a British school once the Chapel Street church was built in the 1850's. In 1871, according to the newly established West Ham School Board, it had a roll of 65. One of the first acts of the new School Board was to construct its own purpose built school, Odessa, with a roll of 703. This opened in 1874 and the National School closed. Its, then, 88 pupils transferred along the road to Odessa school. We do not have a complete timeline for the subsequent fate of the building. 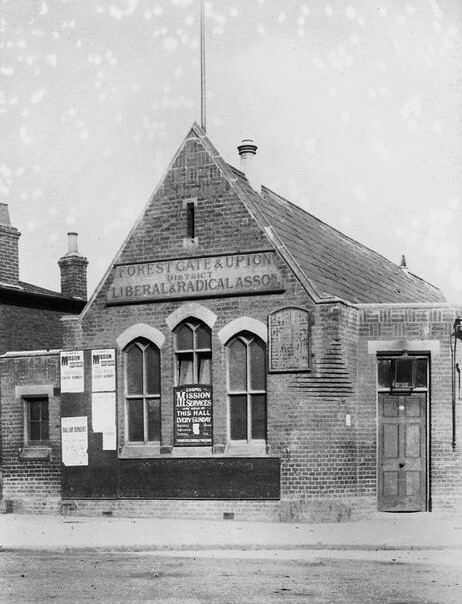 Kelly's Directory of 1890, however, shows it as the headquarters of the Forest Gate and Upton District Liberal and Radical Association, confirmed by the 1895 map, below and the turn of the century photograph taken by prominent Forest Gate photographer, Edward Wright. 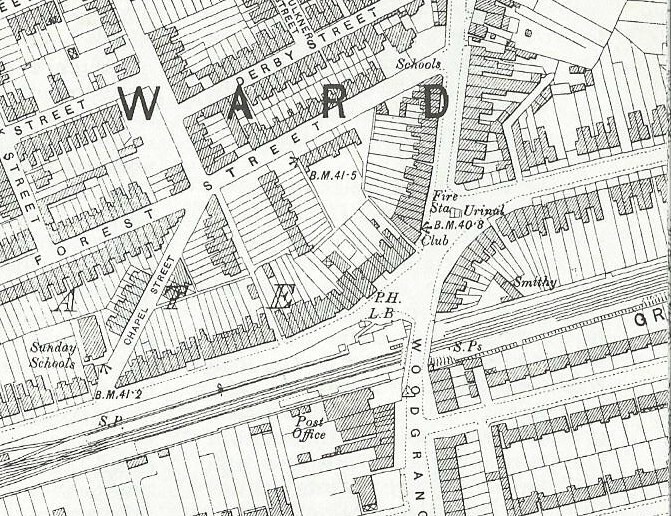 1893 Ordnance Survey map, showing the premises as a "club", and round the corner, in Chapel Street showing a Sunday school (belonging to Sebert Road Congregationalist church) after the church itself re-located, yet again, a couple of hundred yards away to Sebert Road. By 1908 the club had been renamed the South Essex Club. According to histories of cinema venues, the building had a short life as a cinema, between 1910 and its closure at the start of World War 1, in 1914. It was known as the King's Hall (not to be confused with the King's Cinema, which occupied what later became the Upper Cut Club, at the foot of Woodgrange Road). Unfortunately, no photograph of the building serving this function seems to have survived. Between the two World Wars, the building was converted to become Max Fietcher's house furnishers (according to a 1925 trade directory), and subsequently Shenker Brothers, drapers (1938). Following the second world war the premises housed WM John Biles, glaziers and glass suppliers, from at least 1949 until the 1990's, when it closed, having employed a dozen or so people. It was a well-known local landmark and boon to many a local builder and diy-er. Since the 1990's the premises have been a restaurant, in a number of guises, most recently as Angel's - see photograph, below. For at least some of that time it functioned as Forest Gate's most notorious drug dealing premises! Angel's closed last year, having acquired a pretty poor reputation, food-wise and in terms of the behaviour of its customers. Since that time Pyramid Pizza were on the point of acquiring it, then pulled out after a rent hike, and after a short period of continues closure it re-emerged as a meeting place for an evangelical church - apparently without permission for a change of use. The sign is now down - so watch this space for further twists in the development of this rather ordinary, but quite remarkable local building. NB. We are deeply indebted to the publication Hitherto, Henceforth, published in 1956, celebrating the centenary of the Chapel Street church for the sketches, showing the meeting places of the Congregationalists, in Forest Gate. 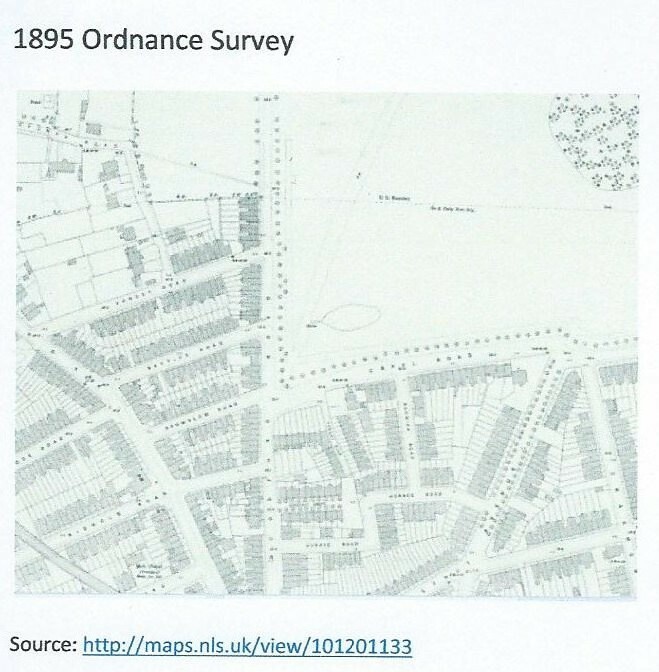 This is the first in an occasional series of articles by local historian, Peter Williams, who specialises in Newham housing, maps and local history. In each he will be looking, in detail, at the history of particular streets in Forest Gate. 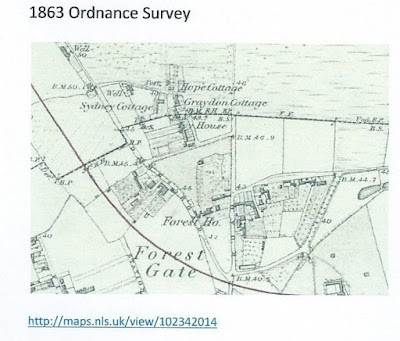 See here for Peter's history of the Fire Brigade in Forest Gate, posted earlier on this blog. 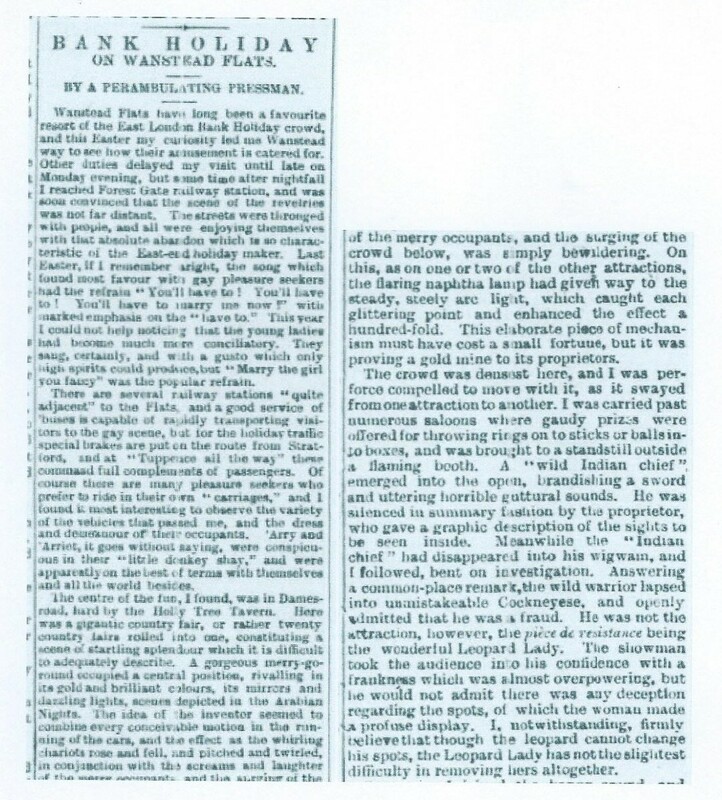 Peter has complemented his own knowledge by accessing the increasingly digitised national newspapers' collection - which can be found via FindMyPast.com - and has added extracts from this that refer specifically to the roads he will feature. The reproduction isn't always great, so we have transcribed sections of them. They add greatly to an understanding of social circumstances of the time. Some, with hindsight, are quite amusing today. Peter would like to express thanks to fellow local historians Lloyd Jeans, Mark Gorman and this website for further informing his work. The current Woodford Road lies to the north of the town centre, right on the edge of the modern London Borough of Newham. The Eagle and Child pub also goes back many centuries (though the surviving building, opposite the Lord Lister clinic, is, itself Victorian). Rocque's map of 1746 marks the Eagle and Child, which would have been used by cattle drovers. They brought cattle, on foot, from the north of England and Wales to the great annual cattle market that was held on Wanstead Flats (probably the origin of the current fairs). 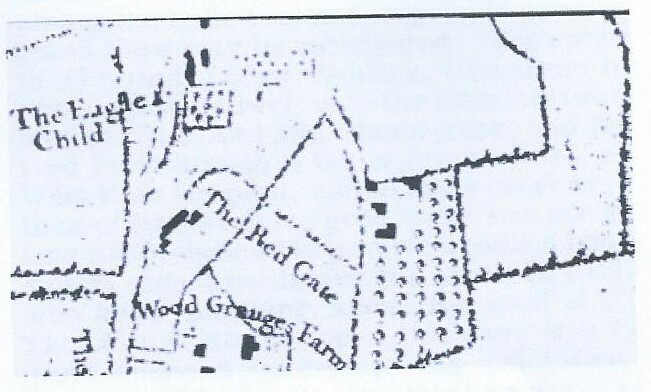 Woodgrange Farm can be seen on the Rocque map, just south of the junction of what is now Forest Lane. The modern Woodgrange estate lies over this farm. 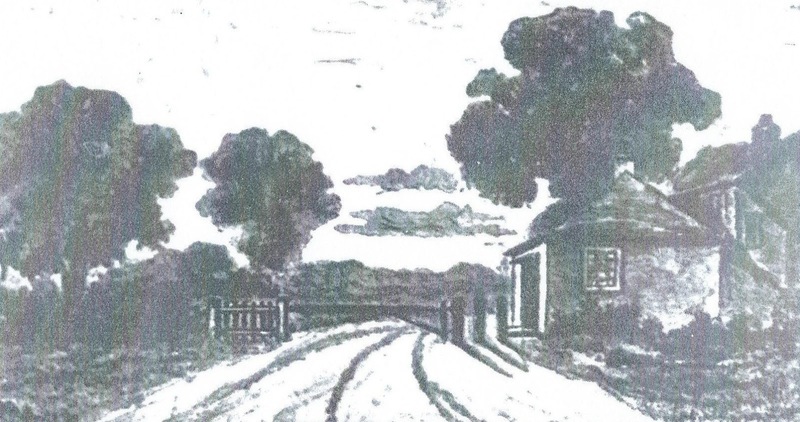 The original Forest Gate (literally the toll gate lying at the southern limit of Epping Forest - the gate was used to control the flow of the cattle drovers) was located between the Eagle and Child and the current Lord Lister surgery. 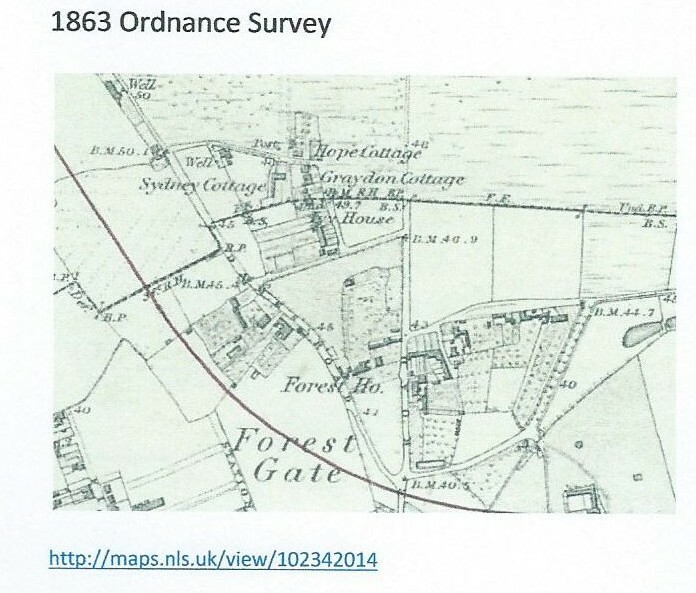 The next useful map is the 1863 Ordnance Survey, published in 1873. Much of the area was still rural in character. The other day, I (Peter) met somebody who lives locally – who had a relative in the 1830's who kept poultry just behind the Eagle and Child. To quote Robert Clayworth's 1837 Sun Insurance schedule "3 tenements north side of the Eagle and Child in Epping Forest". In the mid nineteenth century this area was largely rural, but on the urban fringe. Clayworth had a poulterer's shop on the Mile End Road and a stall in Leadenhall market, in the City. The 1895 Ordnance Survey map, below, is noticeably different from the 1860's map, as the 1870's was the main period of development in the area, with speculative builders knocking up terraced houses cheaply and quickly. Sidney Road has some notably large villas still surviving. That area was developed from 1900. Notice that the southern area of Wanstead Flats is part of West Ham borough council, with the boundary angling past 113 Woodford Road. To the north was Wanstead and Woodford urban district council. The map show more or less the current street pattern. This also marks the arrival of the Tottenham and Forest Gate Junction railway (now the Barking - Gospel Oak line), with Wanstead Park station opened in 1894. You can see Angell Pond at the junction of Capel Road and Woodford Road, developed by West Ham council engineer Lewis Angell to assist drainage on the Flats, which were very boggy. 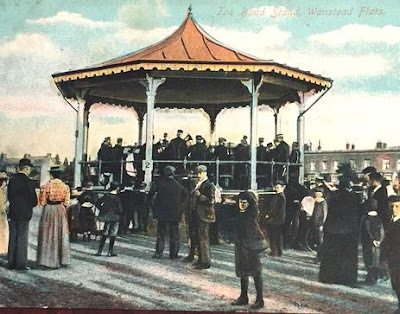 A bandstand soon appeared, to be demolished in the 1950's. The tinted photo of the bandstand in the first decade of the last century (below) shows it in its fully glory. The tree avenue, to the right of the bandstand in the photo, was known as Monkey's Parade. Every Sunday when she was a kid, all the men would dress up in their best clothes and walk the streets to attract the girls or simply to be on their way to see a girl they already had an arrangement with. Winny and her mates would get a bucket of water and a load of newspaper, soak the paper in the water, wad it up into a ball, then try and knock the hats off the young men walking by. 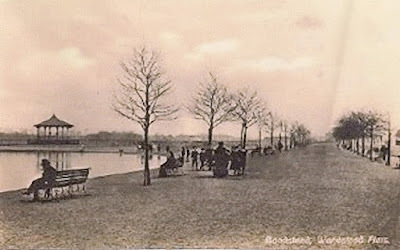 The photo below is a pre 1908 view of the old pond, on the opposite side of Centre Road, before it was enlarged to become the Model Yacht pond. Dames Road is in the background of this photo. 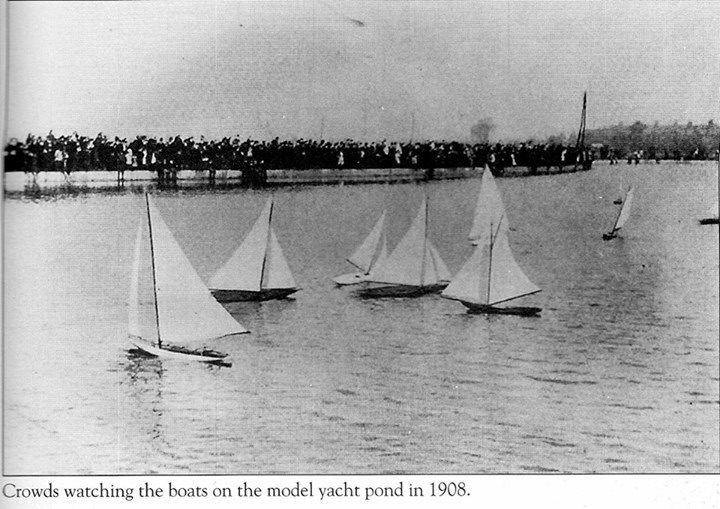 Below is the same pond, in about 1908, when it had been developed fully for model yachting. There are impressive crowds in the background. It was used for much of the time up to the 1960's for model boating - hence its popular name - but subsequently the pond fell into disrepair, did not retain water and became more of an eyesore than an amenity. Local concern about the state of disrepair at the turn of this century resulted in a considerable refurbishment of the pond as a wild life preserve and educational facility, and its re-branding. It is now known as Jubilee Pond, but continues to suffer from problems associated with water loss and leakage. 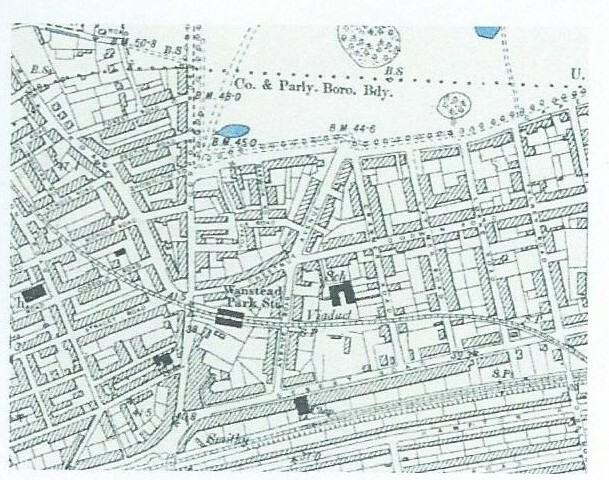 An 1893 OS map shows a small pond with its more northerly end opposite Ramsey Road. Works were undertaken in 1905-6 to improve drainage to Wanstead Flats which included laying surface drains from Leytonstone to this pond. Unemployed labour, mainly from West Ham was used to enlarge the pond to its present size, extending it to both the north and south. Surface water using drains in Cann Hall Road and Sidney Road fed into the enlarged pond, which opened in 1908. As mentioned, above, the fair goes back centuries and is bound up with the movement of livestock into London to feed a growing population, before the advent of railways, in the 1840's. 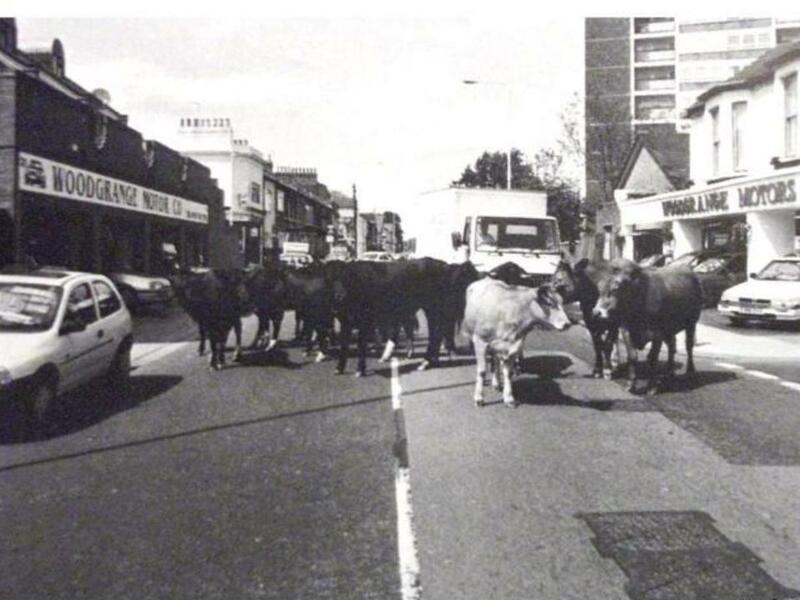 Cattle were driven distances on foot and arrived in East London in poor condition. They needed to be fattened up before being driven to Smithfield for slaughter. They were grazed in the Flats and deals were done in local pubs like the Three Rabbits in Manor Park (see next week's post!) and the Eagle and Child. Local farm owners continue to have grazing rights for their cattle over Wanstead Flats. A right that readers who have been familiar with the area for more than a couple of decades may well remember. It was only an outbreak of BSE in the late 1990's that has effectively stopped (interrupted?) that practice. The delightful photo below records a relatively frequent event, up until the 1980's of cows wandering down Woodford Road. 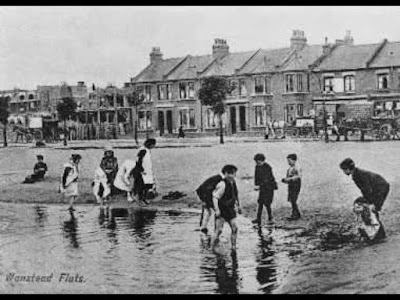 The Flats were also used for horse fairs, and travellers had caravans on the Flats. Within living memory, travellers were born in vans on the Flats. It became a funfair in the late nineteenth century. 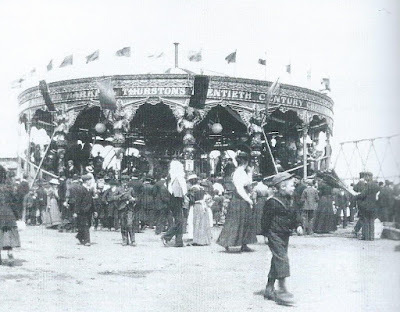 See below for photograph of the Whitsun fair in 1905. 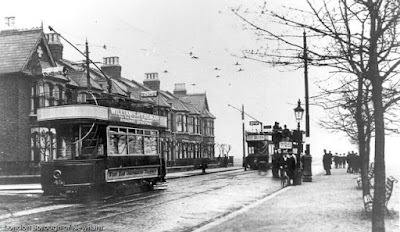 This blog has covered the history of trams and Forest Gate previously, see here. The photograph below shows trams at the terminus in Woodford Road. The trams stopped where the houses ended. The turning to the left is Forest Road. When larger numbers of passengers began to use the services, additional tracks were laid in Forest Road and then at the western end of Capel Road, to facilitate additional traffic. 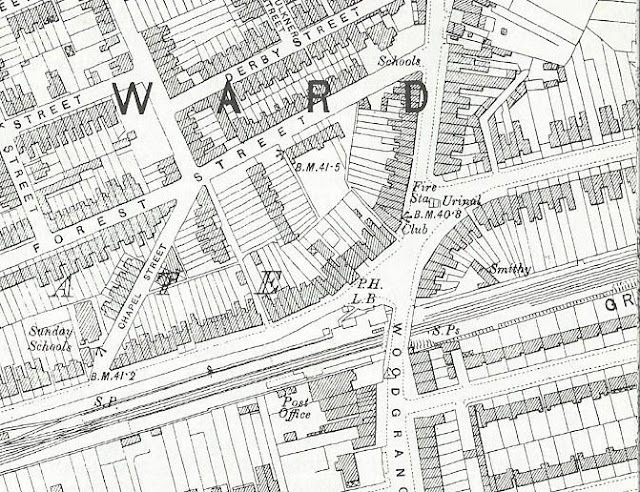 Later the Forest Road length was joined to tracks from the Leyton borough tramways, allowing them to merge in Woodford Road. houses ended, just at the borough boundary. 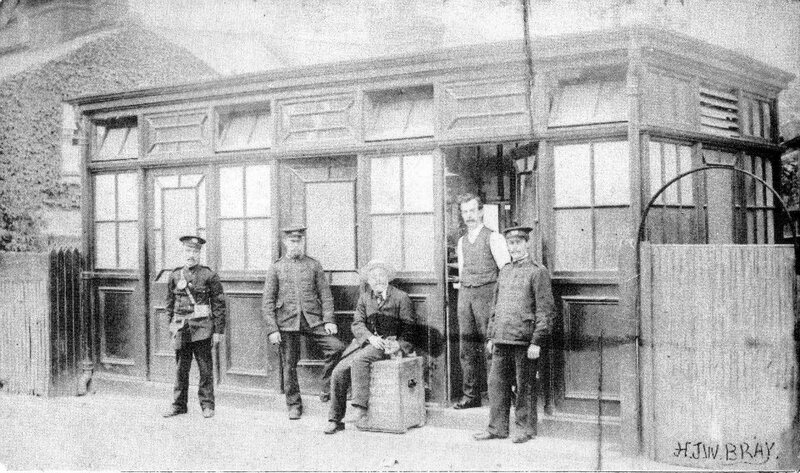 The tram terminus office was located in Bective Road, as this photo from 1903 shows. These flats are very strictly kept, as they are in great demand. The rest of Dames Road, which was built in 1878, is chiefly inhabited by clerks and businessmen in the City, and has shops on one side of the southern end. The rents vary from 8s 6d, per week to £40 per year. 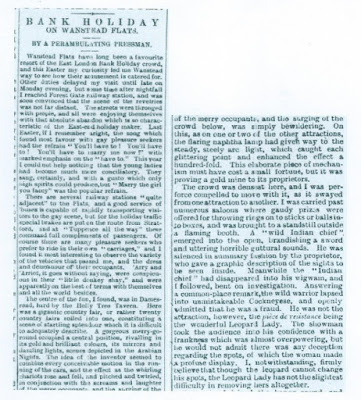 Below are a series of newspaper cuttings, from the nineteenth and early twentieth centuries referring to the area. They offer useful contemporary insights to conditions in the area; and the longest one, offers a delightful description of the Easter fair on the Flats in 1898. The road across the Flats - The Essex County Council wrote offering £100 as a contribution towards the cost of widening the road across the flats. 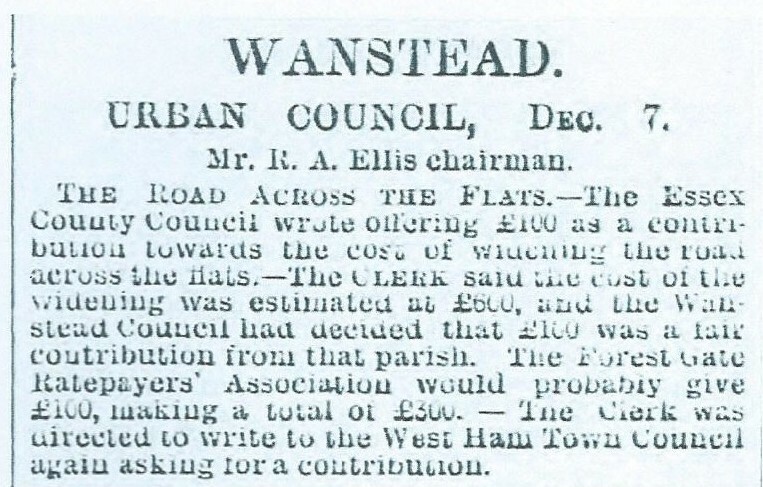 The Clerk said the cost of the widening was estimated at £600, and the Wan-.stead Council had decided that £100 was a fair.contribution from that parish. 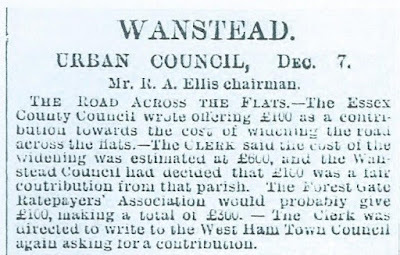 The Forest Gate.Ratepayers' Association would probably give£100, making a total of £300 - The Clerk was.directed to write to the West Ham Town Council.again asking for a contribution. Petitions are being signed in Forest Gate and Leytonstone asking the City Corporation to abolish the Bank Holiday fair on Wanstead Flats. Plus ca change - residents unhappy with the disturbance caused by bank holiday fairs. As working class people acquired more leisure time towards the end of the nineteenth century (enshrined in the Bank Holidays Act and the half day closing of shops), Epping Forest, in general, and Wanstead Flats in particular, became a major leisure destination for workers from Inner East London. There were works outings, picnics and sports teams arriving in large numbers, by train, charabancs and especially by trams, which were cheaper than trains. Thousands could turn up on a busy day, as shown in the cutting below, from 1898. The young ladies ... sang with a gusto which only high spirits could produce, but "Marry the girl you fancy" was the popular refrain. The centre of the fun, I found, was on Dames Road, had by the Holly Tree Tavern. Here was a gigantic country fair, or rather twenty country fairs rolled into one, constituting a scene of startling splendour, which is difficult easily to describe. A gorgeous merry-go-round occupied a central position, rivalling in its gold and brilliant colours, its mirrors and dazzling lights, scenes depicted in the Arabian Nights. ... This elaborate piece of mechanism must have cost a small fortune, but it was providing a gold mine to its proprietors. ... A "wild Indian chief" emerged into the open, brandishing a sword and uttering horrible gutteral sounds. He was silenced in summary fashion by the proprietor, who gave graphic accounts of the sights to be seen inside. Meanwhile the "Indian Chief" had disappeared into the wigwam and I followed bent on investigations. 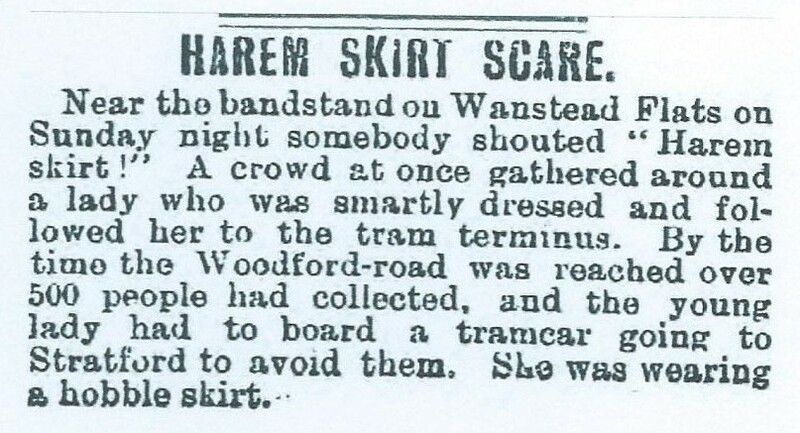 Near the bandstand on Wanstead Flats on Sunday night somebody shouted "Haremskirt!" A crowd at once gathered around a lady who was smartly dressed and fol-lowed her to the tram terminus. 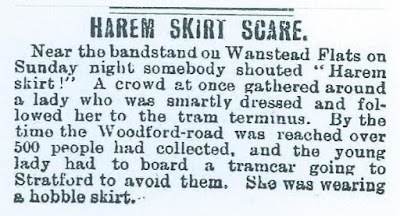 By the time the Woodford-road was reached over.500 people had collected, and the young lady had to board a tramcar going to Stratford to avoid them. She was wearing a hobble skirt. The race for the Hall Cup in connection with the Forest Gate Model Yachting Club was held on Saturday, and was a win for the Vice Commodore, Mr Breach. Messrs. Copper and Wilson tied for second place.